A brutal murder in a small Louisiana town reignites debate about women, guns, and self-defense. Here’s the story the data tells. On the night of August 9, police responded to a domestic dispute at a home in the small Louisiana town of Geismar. In the backyard, they found the bludgeoned body of Monica Johnson. The 45-year-old held an active restraining order against her estranged husband, who police arrested the next morning and charged with murdering his wife with a baseball bat. As the community processed the horrific crime, local law enforcement and pro-gun establishments offered a simple response: arm domestic violence victims to prevent more deaths. 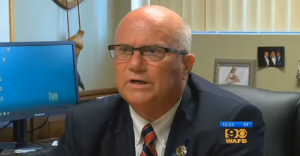 Appearing on a CBS affiliate two days after the murder, Ascension Parish Sheriff Jeff Wiley urged women to get concealed-weapons permits. Twenty-two miles north in Baton Rouge, Wade Duty, the owner of Precision Firearms in Baton Rouge, called the sheriff’s comments “motivational” and announced that he was offering free concealed-carry training to women with restraining orders against abusers. “If you find yourself in this situation, you need to have some options,” said Duty, an attorney and NRA-trained instructor. Wiley and Duty did not respond to a request for comment. But now some local domestic violence prevention advocates are pushing back, arguing that adding a firearm can add new risks to an already volatile situation.